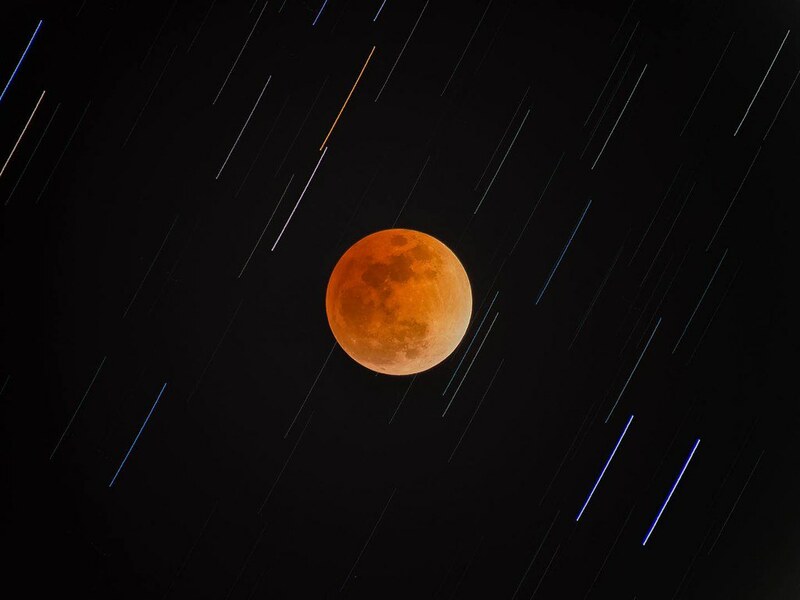 Just want to share some old 2011 total lunar eclipse photos with others. Last edited by Rothkko on Thu Feb 01, 2018 8:06 pm, edited 1 time in total. Higher resolution available at Flickr. The "blue blood super moon" of January 31, 2018, as it sets behind Heart Mountain, near Cody. Wyoming, USA. A snowstorm the previous evening cleared in the pre-dawn hours and we were able to see the eclipse from the beginning until it set. Here is a mosaic of two pictures (not quite in the same angle) Made this winter at my home in St -Liboire, Quebec. Setup: AT12IN f4 on EQ8. QSI683wsg. Autoguiding. ASI120mm on optical splitter. With PHD2. Astrodon filters. LRGB Left Part = 70-30-30-30 minutes. Right part LHaRGB = 120-120-30-30-30 minutes. CCDSoft, PS CS6. 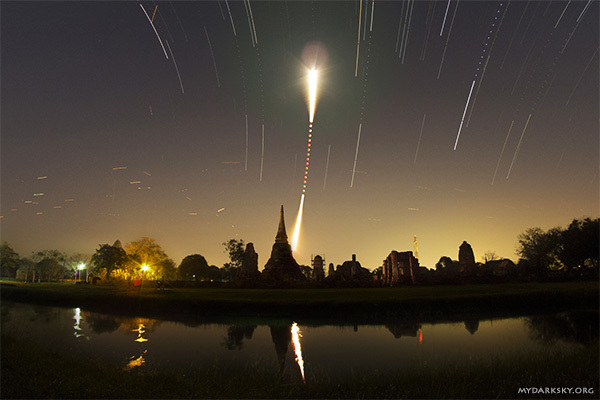 Total Lunar Eclipse of 31 January 2018 (the super blue blood moon) rising over Wat Maha That, a Buddhist temple in the Historical Park of Ayutthaya, central Thailand. This 330-image composite was taken for slightly more than 3 hours, with 5-minute gap during totality. The reflection of the eclipsed moon can be seen in the water. Star trails of the winter constellations (Orion and his dogs, Gemini and Auriga) and random paths of airplane were also visible in the sky. Title: Two eclipses in one day! Technical details: 19 frames showing the ISS extracted from a video recorded with an ASI120 camera on a 80mm refracting telescope. The frames were then stitched with two other frames taken minutes before the transit to get the whole Moon (which does not fit on the sensor of the camera in one shot at 480mm focal length). Transit happened at 23h59m38s (MST) on January 31st. Images taken from the side of Bush Highway, a few miles East of Phoenix (Arizona). Clouds are astronomers’ worst enemies, but they’re really photogenic. 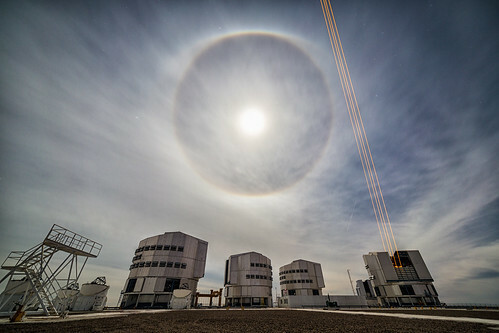 I captured this glorious lunar halo a couple of days ago at Paranal Observatory. Halos around the Sun or the Moon are caused by tiny ice crystals in cirrus at high altitude, which refract the light at an angle of 22 degrees. More precisely, light of different colours is refracted at slightly different angles, which is why you can see a circular rainbow along the inner rim of the halo. In this family portrait of Paranal you can see the four 8 m Unit Telescopes, the four smaller Auxiliary Telescopes, and the VST telescope in the background. The UT4 telescope is shooting it’s mighty 22 watts lasers, as part of a technical test to characterise a new adaptive optics module to correct the atmospheric turbulence. Canon 6D + Rokinon 14 mm at f/4, 30 secs, ISO200. The total (super)moon eclipse of Jan 31 over Singapore! From left to right: The Singapore Flyer, the Art&Science Museum and the Marina Bay Sands hotel during the laser show. The planetary nebula Messier 27 is found in the constellation Vulpecula, which was discovered in 1764 by Charles Messier. 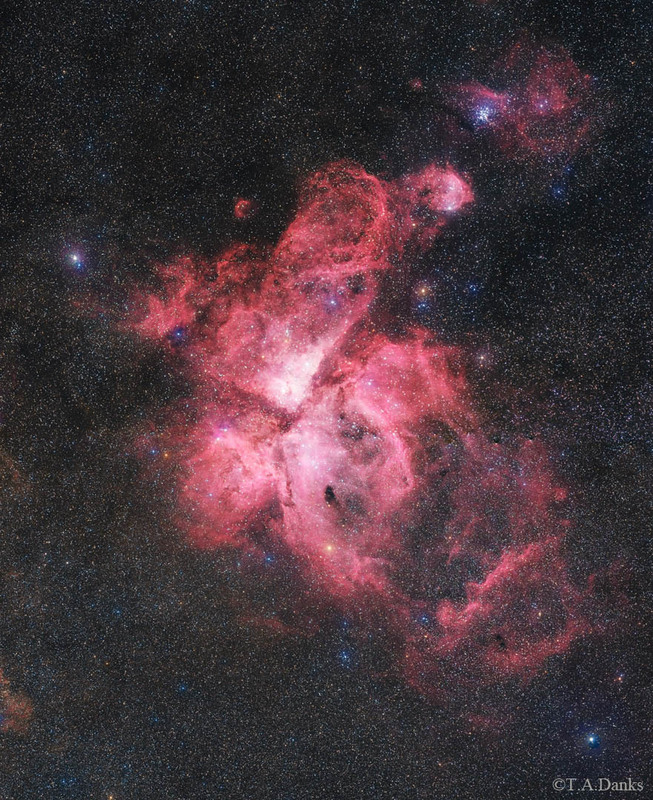 The nebula is approximately 815 light-years away. The outer Oxygen envelope was captured using an O[III] filter. The image is a total of 12 hr exposure taken through three different telescopes: 12.5 inch f/9 RCOS astrograph with a SBIG STF8300c CCD camera (Paramount ME); Astro-Physics 178 f/9 with a SBIG STF8300c CCD camera (Astro-Physics 1200); and a Takahashi CCA-250 f/5 with an QSI683wsg CCD camera (Astrodon 3nm O[III] filter) on the nights of 14, 15, 16, 17 Sept 2015; 15 June 2016; 16, 17, 23 Oct 2017 in Mayhill, NM (13 x 1200 sec Lights at -20 deg C; 24 Darks, 128 Bias; 128 flats). Calibrated, Registered, Integrated, and Processed in PixInsight 1.8.5.1353 Ripley (x64). That is just a splendid picture! 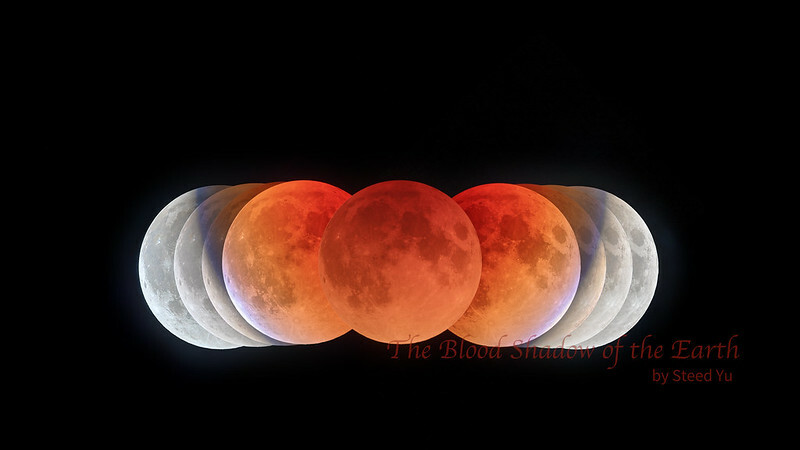 Multiple exposures taken over 4+ hours using a Canon 5D MkII and 28mm f/2.8 lens, ISO 400, f/5.6 with exposures ranging from 1/4000 second for full moon to 2 seconds at totality. Taken from Murrumbeena Reserve, Melbourne, Australia on 31 January and 1 February 2018. Technically, it wasn't a blue moon for the most eastern states in Australia because the full moon occurred at 12.26 am (AEST) on 1 February due to daylight savings. Is taken from a small village with the name Silva Escura in Portugal. 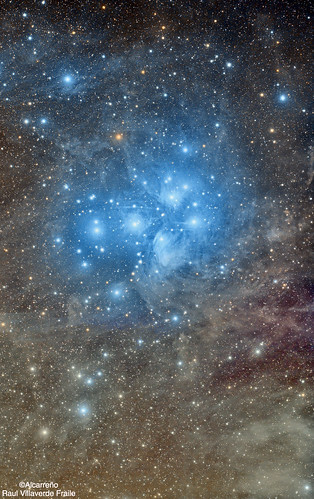 In the image is possible to see many nebulas. M42 the orion nebula, and more to the right VDB 42. 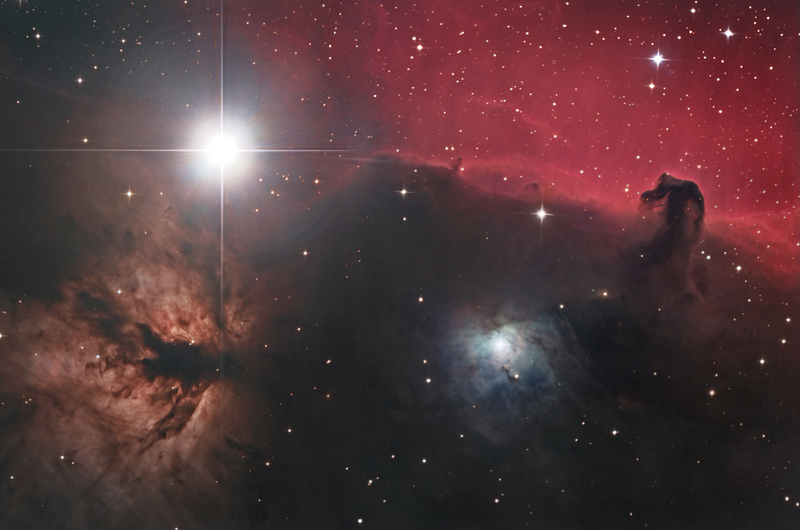 Below M42 is IC428 ,and IC427 . At the bottom NGC 1999 . Last edited by bystander on Sat Feb 03, 2018 5:26 pm, edited 2 times in total. Please note the .gif is slowed down by 4x. 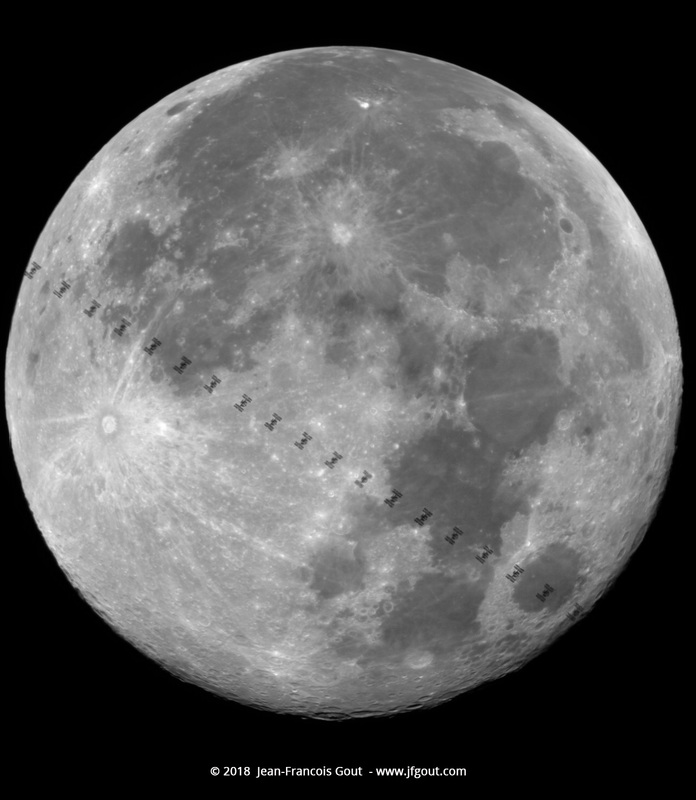 The actual time the ISS was in front of the lunar disk was only 0.59 seconds. 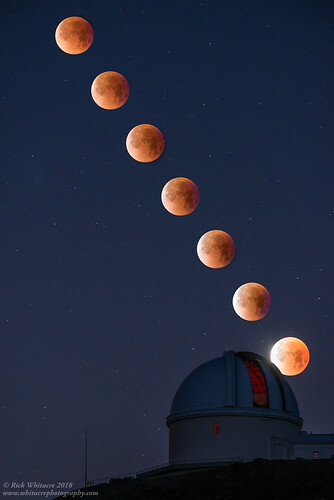 The evolution of the lunar eclipse on January 31 above the mountains in Vestvågøya and Flakstadøya, Lofoten Islands. The panorama also shows how the surrounding light changed during the eclipse. 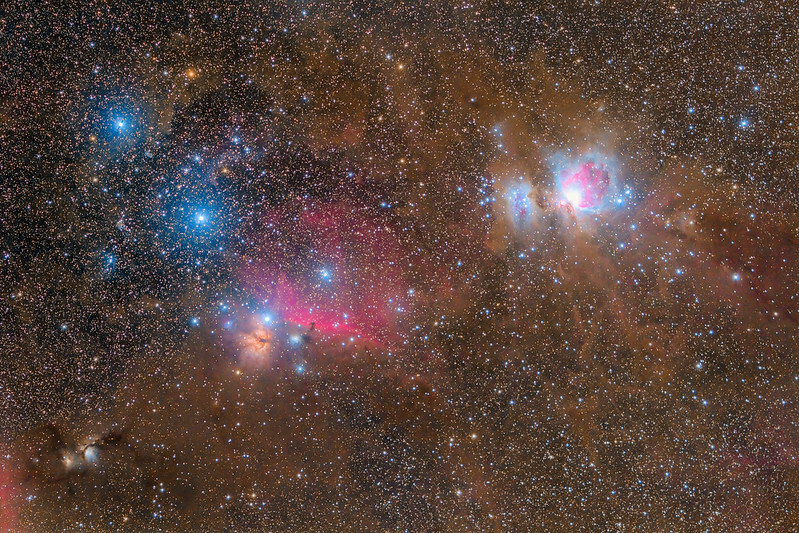 The pano was assembled from multiple shots taken through a Pentax 75SDHF telescope.